Problem #1: Most players cannot see the dead center of the cue ball. Problem #2: Most players differ on 1, 2 and 3 Tips of English on the cue ball. 1. Train your dominant eye or correct dominant eye misalignment. 2. 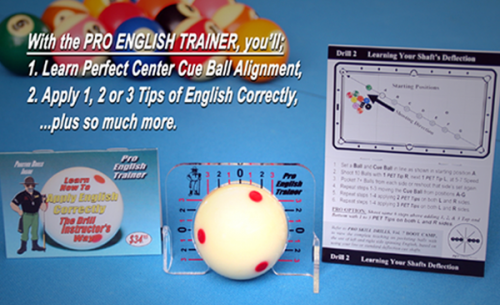 Develop perfect center cue ball sight and point of contact accuracy. 3. Correctly measure and execute 1, 2 & 3 Tips of English. 4. Measure the correct factor of deflection of your personal playing shaft. 5. Develop a perfect follow-through to maximize cue ball action. 6. Trains you to stop jumping up on shots causing stroke misalignment.